A couple of weeks ago I was mourning the end of the brilliant summer we had and the fact that an Indian Summer never materialized. My tomatoes, peppers and sunflowers continued to grow and bloom but I needed to put on a sweater or jacket to sit out on the balcony, the leaves n the trees took on a variety of red, gold and brown shades and the rainy, windy weather started up. So I decided to embrace the Autumn by crocheting something for the season. It was a lot of fun to make. I have fun seeing bits and pieces here and there online and then making it from just what I see. I don’t really use patterns. I just look at an object and then imagine it constructed in yarn. I spend quite a bit of time checking out the pumpkin and gourd display on a trip to the local garden centre recently and didn’t buy anything. It takes a lot of experimenting and lots of frogging but it’s so satisfying to have someone correctly identify what it is that I’ve struggled to recreate. I’ve also learned to take very detailed notes as I go along so that I can recreate it again when I finally get it right. I had it mostly all put together but felt that it was missing something. I had made the sunflower last year and it was being displayed in a vase and admired by all that saw it. The other day I was checking out the balcony after a severe storm and was doing an inventory of what was left and still viable. Being prepared for the storm and securing as many of the plants as possible there I was fairly lucky. The pot with sunflowers had been knocked over though but when I put it right I noticed that more flowers were just about to bloom and how pretty it looked in contrast to the multi-coloured leaves on the trees. 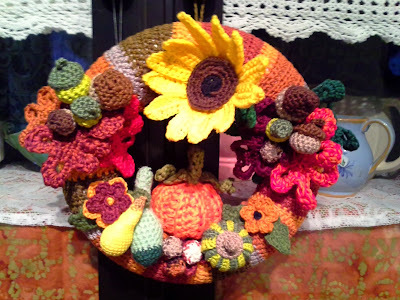 Thus I was inspired to add the sunflower to the wreath. 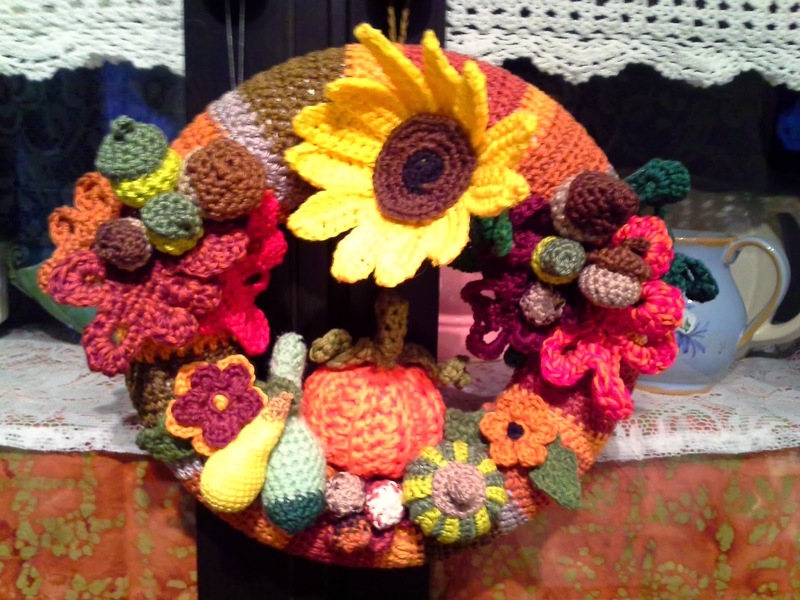 The whole wreath is a tribute to the beautiful coloured leaves, flowers, veggies, etc. that Nature gives us during this time of the year: a little something to cheer us up during the colder weather and shorter days. The wreath is now on my front door where I hope it cheers everyone up as they go by my door in the cold, dark mornings on the way to work or school and in the dark, cold evenings as they return from their long day. PS: I’m still working on how to get my photos to look better short of spending hundreds of €€s that I don’t have on a new and probably complicated camera. 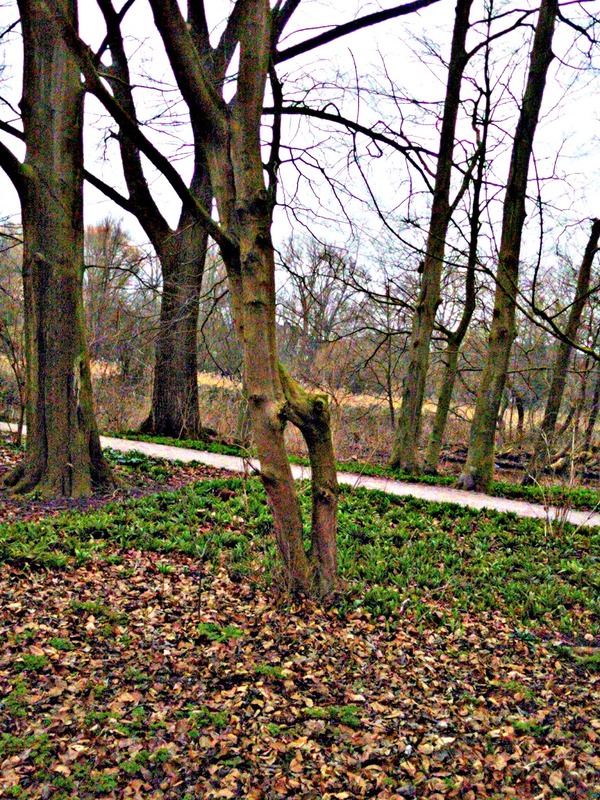 I’ve really got to get to grips with the photo editing software that I have but find it all quite daunting. And can I really improve the photo quality that much from a plain old point and shoot camera? Whew! I finally made back here. It was a tougher journey than I thought when I said I’d be back soon in my last post in September. But of course events conspired to keep me from Blogland. Luckily the shop had the same exact drive that my laptop uses so I ordered it and it arrived two days later. I managed to get it hooked up and recognized by the laptop. Another problem I encountered was that Windows 7 had been preinstalled in my laptop with no discs. I had to reformat but had nothing to reformat it with. After a bit of Googling where I discovered that I could download Windows7 from the Microsoft site and as long as I had the COA for my laptop it would all work. I downloaded the ISO and with the help of some easy to use software was able to make a bootable flash drive rather than a dvd. I got everything up and running but had to search for many of the drivers online and download and install them. After a couple of days I had everything installed and tweaked to the way I like things. I tested the failed drive with some diagnostic software which said it was healthy but needed formatting and decided to put it into the spare spot that I had noticed in the laptop when I doing my removal operation. I’m now using that drive for storage and with 750 more gigabytes I was able to but all my music and photos on it as well. I don’t trust the drive 100% so have been more diligent with my back-ups to another external HDD. But it’s handy having those things right here without having to hook up to some other gadget to view photos or listen to music. Now I can organize all those photos finally. 1. Don’t leave the HDMI cable connected when not in use. 2. HMDI cancels any hibernation or sleep options. 3. Back up more regularly. 4. Always have a physical copy of your Operating System. Get this sorted right after you acquire the new machine. 5. I don’t need to pay a technician to fix my laptop. I’m pretty damned good at troubleshooting and fixing the problem myself. I’m also rather comfortable removing and replacing hardware, even from laptops. 6. Sometimes it’s worth it to pay for software. After lots of frustration, aggravation, anxiety a bit of money I finally have things working the way I want them to. I was in the middle of making a blog post when the crash happened but had to scrap it in order to move on to it being November now, clearly late autumn/early winter and not the late summer I was trying to trick myself into believing it was. But I will allow a short revisit because I spent many peaceful afternoons sitting out on the balcony and crocheting or reading, listening to the sounds of life all around me and sometimes to music. We’ve got a nice assortment of birds that live here in the trees and I enjoy watching them and listening to their sounds. I was enjoying it so much that I didn’t take nearly as many photos of all the growing things this year as I did last year. The plant with beautiful orange flowers is called Ornithogalum dubium. I bought it just before Queensday (29 April) in a shop on the Albert Cuypmarkt for a very cheap 1.25 and it kept blooming all summer and well into September when it very quickly gave up the ghost. I’ve been searching around for bulbs to grow it again but have had no luck. I tried to keep the bulb for this plant but it developed mould as did some saved tulip and narcissus blubs and had to be thrown out. In the spirit of being neighbourly I offered to water my upstairs neighbour’s plants while they went to Argentina for a month July-August. We happened to have had a long very hot and dry spell during that time and I was kept going trying to keep my plants going as well as theirs. These peeps have plants EVERYWHERE in their apartment! I was only going to take care of the outside plants but noticed floppy foliage all over the place when I was walking through from kitchen to outside. Every time I looked there was another plant that I hadn’t noticed before: on top of the fridge, on various shelves on bookcases, etc. They were coming out everywhere at me! I didn’t even check one of the kids’ rooms and missed a few plus one window box. But I got a shot of what my entire balcony looked from above. I moved the tomato plants in the mid afternoon so that they could also get the brilliant late afternoon sun at the other end. And now back to November….. Regular blogging will resume very shortly. I’ve been a little busy lately. PS: I hope you find this font easier to read. Well, it’s been a long wait for spring to finally arrive. I think it’s safe to say that as of this past weekend, it’s here at long last. I’ve been busy watching nature show me all the signs. First it was “the neighbours”. These birds have been hanging out in that same tree for as long as I’ve been here. I first noticed that they met there around 4 pm-ish. Then I observed them sparring for what I thought was territory and then upon further observation noticed that they were mating. I watched them every afternoon from the comfort of my comfy lounge chair and let them be my entertainment. I now know when they’re hatching because only one will show up to sit for a while and then just when the other one appears it takes off. I can’t figure out where their nest is but it’s somewhere very close by, perhaps even on some part of the roof in this building. The first time only one appeared I got very worried as I know that they pair generally for life. 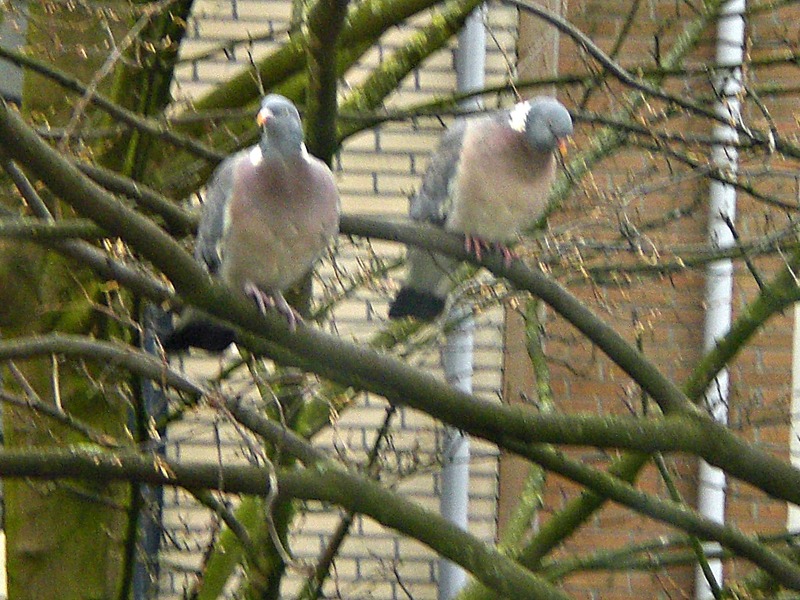 A bit of Googling told me that city pigeons can live for up to 15+ years. So, they could still have a fw more years yet to entertain me but I don’t know how old they were when I first moved here. But moving on…I saw them collecting twigs and dried up stems of dead plants from all the gardens and balconies back here. 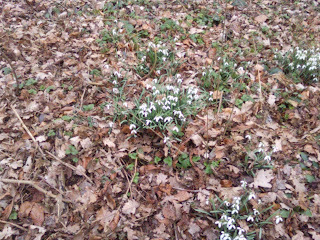 So I know that that nature’s spring renewal was on it’s way. On the subject or birth, I was reading recently about this and saw a piece on this on tv Lotus Birth. I’m all for natural but this isn’t really natural, is it? All other animals with umbilical cords chew through it to separate baby from what it doesn’t need any more. Sometimes I think us having a supposedly rational brain that allegedly gives us dominance and superiority over the rest of animal-dom hasn’t really worked. I don’t think anything said in defense of this could make me see it as anything other than lunacy but I’m open to your thoughts on this. And to add further to the birth topic, the upstairs neighbour is expecting again in 3 weeks time! It was a surprise pregnancy following soon after the birth of the last one whose 1st birthday party we attended last Saturday. It seems like only a few months ago I made this for them. So there’ll be another new life in this building soon as she chooses to birth at home. She doesn’t do the Lotus Birth though, smart woman. The first bumble bee has chased me from the balcony to the safety of indoors already prompting me to get the Epi-pens sorted out for this year. Having had a few very serious reactions to bee stings I started to faithfully have one nearby at this time of year but luckily since I’ve started that practice no bees have got me since. (My new allergic thing seems to be raw pineapple , of all things. I actually got the Epi-pen out and ready to go when my throat started closing up and my tongue swelling the last time I had some. It had happened a couple of time before that but as severe and it took me a while to realize that I had developed a new thing to be allergic to.) You’ll understand though, if I don’t supply a photo of said bee since no way was I getting close enough to one to do that! All the plants are in bloom and my tomatoes, etc. are enjoying sunny but sometimes cool weather. I’m still taking them in at night since it’s still going down to not much more than freezing. I’m thinking of letting them stay out full time this weekend and just take my chances. 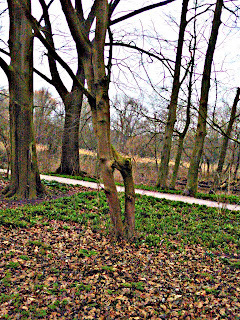 Taking a walk in Flevo Park a few weeks ago I happened upon this tree which I found to be very interesting. With all the mating and new life going on all around I thought that the trees were even trying to get in on the act! There was definitely an insertion of one small tree into the other. I checked the root patterns and it seemed to be two different trees. Very curious!! I haven’t been able to get around that much lately because of the affect of the changing climate on my body, mostly my joints. I have days when I feel like I way about 100 lbs. more than I do and with a lot of flue-y type aches and pains. My knee swells up at lot at this time and alternates between being very tight and locking up to slipping out of place at any given time whether sitting, standing or walking. The loose and slippy joints in my shoulders and wrist make it difficult to support myself with the crutch that my knee requires. Luckliy I can watch spring happen from my chair and my wrist still allow me to crochet. For some reason for which I’m extremely grateful for I can usually still manage a bit of hooking when nothing else on my is working properly. Sometimes it’s a good relaxing exercise to shift my attention from my pain to something positive I can see happening in front of me. Here’s a couple of things that I’ve made lately. The rest you can see here or you can click the Flickr gadget on the right of this page. Another positive thing is that Marks & Spencer has returned to Amsterdam. Happy Days! It couldn’t have come at a better time, when standing up to cook and even cutting and preparing food is painful, difficult/impossible. I’ve managed to cut my fingers a few times lately while attempting to cook. Me and my kitchen are on a break right now and M&S has taken over. Crumpets, oh how I’ve missed you! And I’ve been introduced or should I say seduced into the fun of Percy Pigs (veggie version.) for my sweet tooth. Damn you, Steve! I’ve bought a selection of meals and sides to keep me for a few days. Getting there is relatively easy if I can make the 5 minute walk to the tram stop. Today, I got there and back in less than an hour including a long leisurely perusal of all the shelves and aisles while deciding on a well-rounded 5 day menu based on what they have. Alas, they were out of their wonderful cole-slaw--the only disappintment of my trip. I’m trying to type this while sitting outside but the sun is getting way too brilliant in this spot to see the screen. Rather than move around to a shadier spot I think I’ll end here and get my hook and yarn out and see what I come up with while enjoying these glorious rays from a more comfy chair. I found myself watching the inauguration of the new Pope in Rome the other day. It followed soon after the former Pope’s (mysterious) sudden resignation and departure after seeking legal, permanent “sanctuary” in the Vatican. When I first heard his new name I assumed that he was styling himself after St. Francis Xavier, co-founder (along with St. Ignatius Loyola) of the Jesuit order that he’s a member of. I was encouraged that perhaps this meant that he was the start of a new, less corrupt Church and as one of the “military” (as Jesuits are described) who was going to clean it up . But instead he’s apparently decided to be the very first Pope to choose a man who’ was so “out there” that he talked to animals as his idol/model. Is he hinting at a planned escapist approach of “hear no evil, see no evil” in order to preserve the Vatican status quo? While still on an Italian theme, we were having a walk around the Jordaan the other day (in the freezing cold) to do a bit of window shopping on the Nine Streets. As were walking there after getting off the tram I spotted this in a café window. Beneath the two rows of tiramisu was tray full of beautiful cannoli! They are my very favourite pastry of all and so hard to find in this part of the world. My Italian food appreciation was cultivated while living in New York with it’s vast diversity of ethnicities. There were many Italian bakeries around and I took the availability of cannoli for granted. When I moved to Ireland I I never once in over 20 year saw a cannoli throughout the entire country. Trips to London never yielded this illusive pastry either although all sorts of food products that I missed from the US could be found there. Other Italian desserts were widely available in both countries. Tiramisu was everywhere. You could get a wide variety of Italian deserts from Marks & Spencer or Sainsburys but alas no cannoli. I based my “I’m completely at home now”feeling mainly on what foods that I can find that I was used to from the USA. My list included ricotta cheese, plaintains and cannoli at the top of it. Slowly but surely I found most these things in Ireland as they modernized. They never did get plantains but I could get them when in London so would occasionally “import”a few when I visited my son over there. But never did I see a cannoli. When I visited NY it was the first thing I wanted to eat, followed by a pizza, Dunkin’Donuts French cruller and a warm pretzel from a stand. About a year ago while walking down the Haarlemstraat I spotted some cannoli in a window of Mondo Mediterraneo . It was as though I had spotted a mirage. I had to take closer look to make sure my eyes weren’t playing tricks on me. (We had just been in a coffeeshop.) But it was real cannoli! I went into the shop and saw that they had two sizes of them. We bought 2 large ones and 2 small ones to go and I remember eating a small one on the walk to Centraal Station to get the tram home. I was in heaven! I’ve had them a few times since (along with some delicious pasta dishes from there) and OH has fallen in love with them, too. So here we were on a random walk and I spotted them in another place. 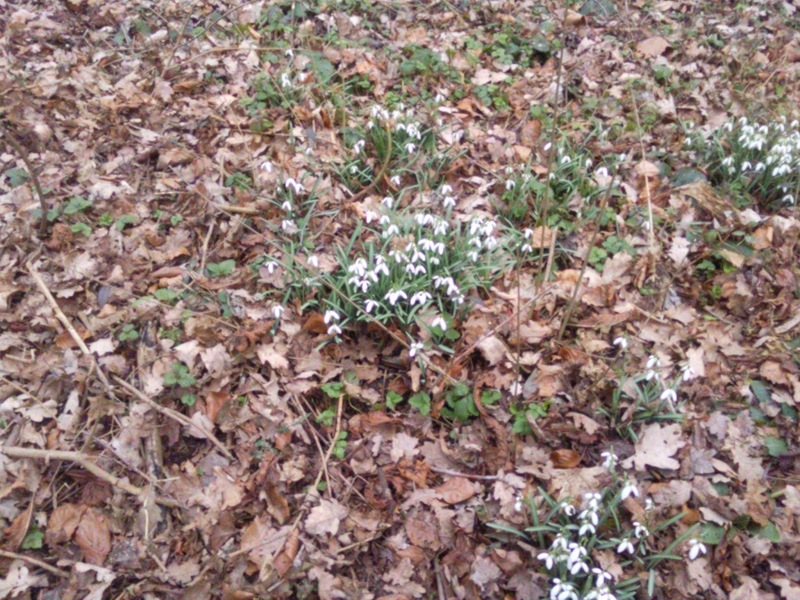 They’re springing up all over! I’m really feeling completely at home here in Amsterdam food-wise. I can get every single thing I used to get in NY and then some. Cooking and baking have become a real adventure these days and I’m experimenting with so many new things. I’d like to try to make my own cannoli. I know how to make the filling but apparently you need a special yoke ( Derry-speak for gadget) to make the pastry tube. But I’ve got a few ideas and one includes making it a slightly different shape. Hello Friends and Curious Anonymous Readers! I hope that the end of the old year and the beginning of the new one has treated you all kindly. It’s been a while since I posted here. There are several reasons for it but the biggest one was that I wasn’t happy with where this whole thing was going. To begin with, I didn’t like the title. A blog title needs to “do what it says on the tin” and I sort of boxed myself into a corner with the brief for my blog being things that I make or do. But that’s only a part of my life and I was feeling stifled by it . It really wasn’t all about the hands. Besides what I make and do I wanted to talk about things that I see or places I go and how I feel about those things. I may even get on my soap box from time to time since that’s my nature but I’ll try to keep it to a minimum. I think that this new title reflects my little piece of the blog world. “Terry-ness”has been a term used by various friends over the years to describe my particular style of doing things or way of looking at the world which is often unconventional to them. To me, it’s just me being me. :) So welcome to Terryness and I hope you find it interesting or entertaining to visit. Feel free to speak up too!